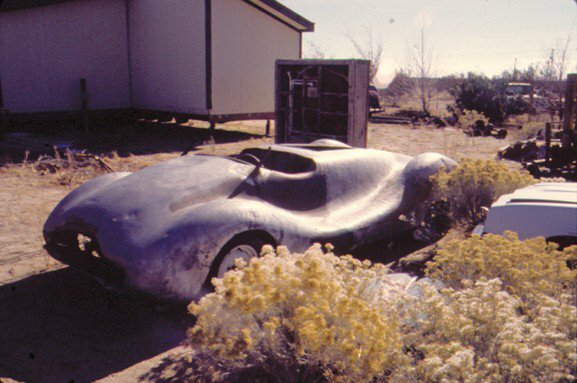 This time it’s the Norman Timbs Special; a homebuilt streamlined car by an ex-Tucker engineer. Cut his teeth on Indy cars, and decided he could take a brand new ’48 Buick straight 8 and put it a slightly more impressive home. $10,000, countless drawings, several 1/4 scale clay models and one full size wooden model later… he had created this one of a kind masterpiece. Norman E. Timbs was a very talented Los Angeles based automotive engineer who worked with Preston Tucker on his car, he also built Indy cars for the Keck family. 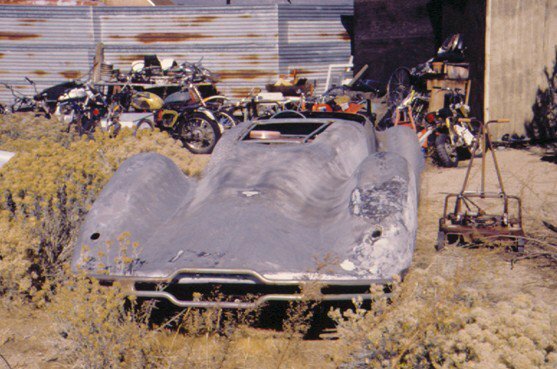 Among many other fascinating projects, he designed and built his own rear engined custom roadster with a Buick 8 cyl engine. Leading up to this design, Mr. Timbs had worked as an Indy 500 designer on cars such as the Blue Crown Specials which won Indy several times. Mr. Timbs was no doubt influenced by the 1937 Auto Union Typ C Stromlinie and 1937 Mercedes-Benz W25 Avus Stromlinie which ran the 1937 Avus GP. His sensational shape was a very close approximation to these cars which ran the fastest GP race of all time nearing speeds of 248.40 mph (400 kph). Curves like these inspire poetry. 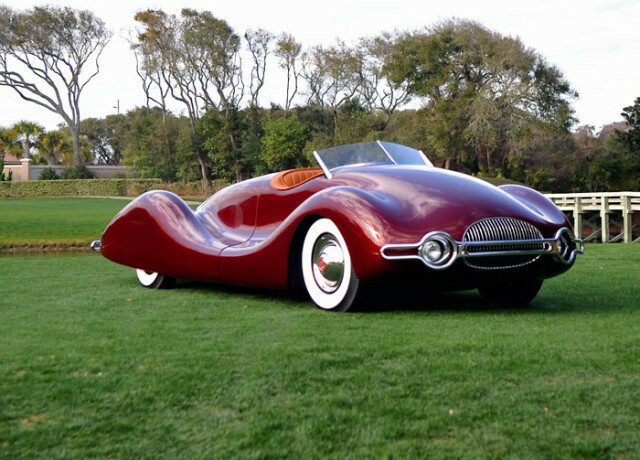 The 1948 Buick Streamliner is a muse in the world of classic cars, an automobile from a time when curvy was most desirable in the eyes of men. Looking at a car like this makes one lament the slim, simple direction human attraction has gone, when the cars and cover girls leave plenty to be desired in the most important aesthetic quality– shape. This classic Buick Streamliner is in pristine condition, restored by Dave Crouse for the 2010 Concours d’Elegance. Its original construction took over two years, built with an aluminum body around a steel chassis. A Buick Straight-8 engine sits in the middle of the roadster, right behind the seats. The steering, brakes and other equipment are “standard Mercury,” according to the website kustomrama.com. The structure is made of steel tubing and the body of aluminum. The entire bodywork aft of the passenger compartment is one piece. It lifts like a clamshell to provide access to the engine, fuel tank, rear wheels and spare tire. A trunk is in the nose of the car. There are no doors; you have to climb in. The snug cockpit, accessible via step plates on each side, looked like that of a high-powered luxury speedboat, with a Stewart-Warner five-gauge accessory panel offset to the right that included a rare 0-to-5,000-rpm tachometer. Other instruments, including an Echlin fuel pressure gauge, were mounted in front of the driver. The full complement included a speedometer, vacuum gauge, air and oil pressure gauges, as well as dials for fuel and water temperature, and an ammeter. There was a wood-rimmed three-spoke accessory wheel and a column-mounted Ford shift lever. As the pièce de résistance, the cockpit, dash surrounds, door panels and seat were resplendent in tan tuck-and-roll leather. No top was ever fitted. The design of the car was influenced by several pre-World War II race cars, such as the Auto Union Type C and the Mercedes-Benz W25 Avus Grand Prix cars. 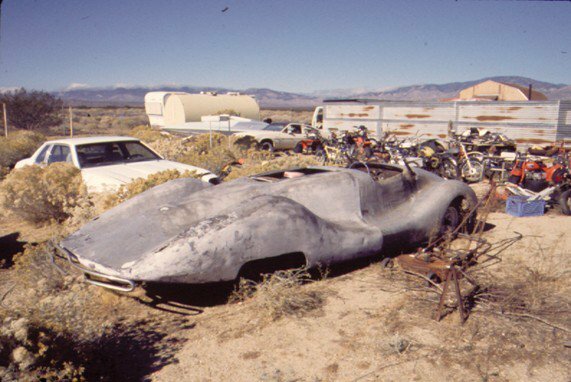 By the mid-1950s, the car had been painted white and was in the care of Air Force Officer Jim Davis of Manhattan Beach, California. It was auctioned off at Barrett’s in 2002 for over $17K, and after an incredible restoration. Much of its later life was spent outside, in a desert, where it deteriorated over the years. In 2002, it was auctioned by Barrett-Jackson at the Petersen Museum Classic Car Auction. It was sold for the sum of $17,600. The new owner began a restoration. The body of the car was about 90% original.